How Will We Know If HealthCare.gov Is Fixed? Saturday is the day the White House promised the website for the Affordable Care Act will work for the "vast majority of users." NPR's health policy correspondent Julie Rovner explains what that means, and whether the deadline is going to be met. How Will We Know If HealthCare.gov Is Fixed? 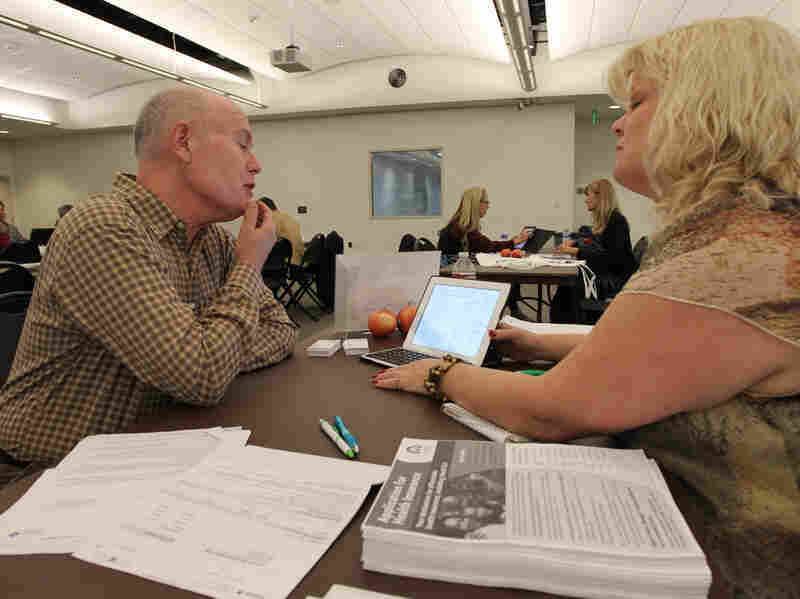 Health care specialist Stacy Chagolla helps William Bishop compare plans at an Affordable Care Act enrollment fair in Pasadena, Calif., this month. Saturday is the day the Obama administration set as its deadline for making HealthCare.gov a "smooth experience" for most users. A tech-savvy team of engineers, database architects and contractors has been working through the holiday to ensure the White House makes good on that promise, but judging the success of their efforts may take some time. How will we know whether the website is fixed? NPR's health policy correspondent Julie Rovner says that partly depends on how you define "fixed." She joins Weekend Edition Saturday host Scott Simon to explain what that means. Remember the promise is to have it working for what they call the "vast majority of users," by which the administration means 80 percent of visitors to the site. That means 1 of every 5 people will still need to use a call center, an in-person counselor, or a paper application due to a technical problem or because his or her individual situation is too complex to be handled online. So Amazon or Orbitz this is not. But then again, this is not buying a TV or a plane ticket, either. Many people have pointed out that spending a couple of hours buying health insurance online is still a lot faster than the old way, when you might have had a 50-page paper application and a process that literally took weeks. There was a little show and tell earlier this week, where the White House actually showed reporters some of the 300 or so people who have been working pretty much around the clock from various centers located in the Washington, D.C., suburbs. They've got a separate hardware team doing upgrades to increase the website's capacity, for example — they're saying it should be able to handle 800,000 separate visits per day going forward. Then another team is working on software. They're fixing bugs and trying to make the website more user-friendly for consumers. Will anyone be able to tell if the site is really fixed? We do know a big test is likely to come on Monday, when people who have been talking to relatives over the long holiday weekend — or who wake up and suddenly realize it's December and they want coverage in January — all try to sign on at once. Double Take 'Toons: Healthcare Webslight? Insurance companies are getting increasingly worried. It seems that while so much effort has been going into what they call the "front end" of the site — where consumers go to compare insurance plans and sign up for coverage — some parts of the "back end" of the site — where insurance companies actually get paid — haven't even been built yet. The administration says it will get that done before money has to begin to change hands sometime in January, but given that nothing up until this point has happened on schedule, that doesn't make insurance companies feel a whole lot better about things. Small businesses were supposed to be able to sign up online to enroll their employees through the federal website starting this month. That was already delayed from Oct. 1. Now that won't happen online until next November. They can still compare plans online, but they'll have to use paper applications and go through an insurance broker or agent or an insurance company directly, unless they're in one of a handful of states that's got its small-business exchange up and running. The administration has been pretty candid about this — they've said their top priority is to make the website work for consumers first, and pretty much everything else is taking a back seat.